Four recently-beheaded chickens, coming from four cardinal directions, all head toward a crowded chicken processing plant at the same speed. Where do they intersect? This isn't the beginning of a riddle. It's a question I ask myself every time I queue up for random squads matches in Fortnite Battle Royale. I queue for random squads a lot, not because I hate myself, but because I am a lonely Fortnite Battle Royale player. If my buddies aren't still stuck on PlayerUnknown's Battlegrounds like the sadists they are, they have some moral objection to battle royale games. Probably, that's their fear of death talking. I'm not a shrink. Anyway, what this means is that, when I'm queuing for a Fortnite Battle Royale game, my active friends list often displays the number zero. Randoms are my only option. There's a language to Fortnite Battle Royale random squads, and, most of the time, it doesn't involve talking (I don't use my mic in these matches). Fortnite Battle Royale players will pull up the zone's map while they're together in the Party Bus. You're supposed to drop a pin where you want to land so everyone knows to land together. Usually, one person initiates. They will put the pin on, say, the low-key Tomato Town zone. In an ideal world, everybody would silently concur by dropping their pins there, too. Then, they'd all parachute down in unison and, moving like an amoeba through Tomato Town's buildings, collect and share weapons and items to bolster their collective strength. They'd take turns mining materials and constructing forts to protect each other. And they'd save each other when they're in danger. Twenty minutes later, they're the last squad standing. A rainbow shines overhead. We don't live in an ideal world. I don't need to tell you that. It's a stupid world, and nobody ever knows what they're doing, least of all in random squads Fortnite Battle Royale matches. Hence the beheaded chickens metaphor. I had a perfect game in this regard last week. It wasn't "perfect" in that we won. It wasn't "perfect" in that we even met up. It was "perfect" in that I couldn't have asked for a better waste of my time, or a more accurate representation of life in random squads. Here's what happened. I queued up with three randoms and, map open, dropped a pin down on the Haunted Hill, a fun and easy-to-hide-in zone in the map's northwestern corner. 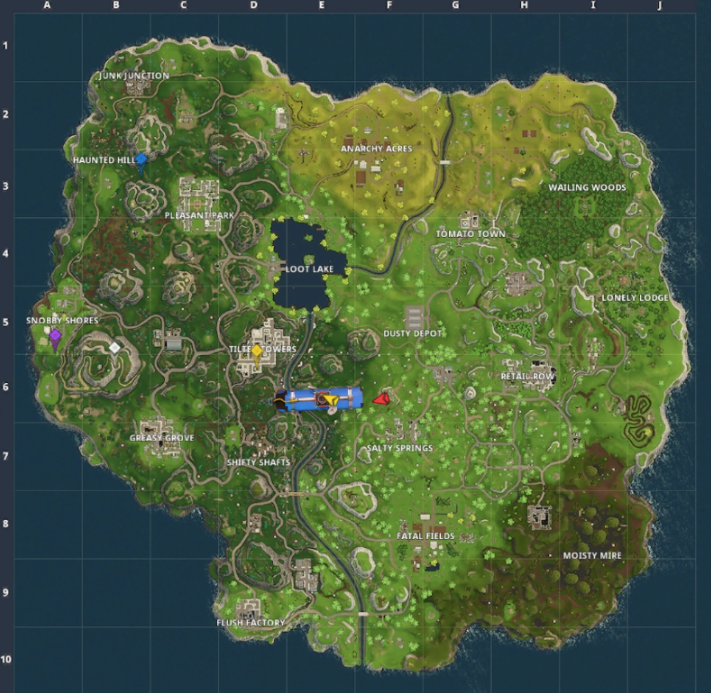 Another teammate dropped theirs on the Snobby Shores, the westernmost point. Another didn't drop a pin; they just floated down from the map's eastern section toward the middle. And the final one dropped a point down on Fortnite Battle Royale's very own death-blender, the Tilted Towers, smack dab in the centre of the map. They then headed straight for it. Any solo player navigating a squads game is at a disadvantage. If they encounter an enemy, it's likely that they will be going up against three of their teammates, too. My squadmates and I had to meet up. And the centrally-located Tilted Towers was the obvious place to go. It's Fortnite Battle Royale's gravitational centre. It is full of items as well as dozens of the game's most confident players. So it's also sure death. I once described it as the gameplay equivalent of dropping a fistful of Mentos and shotguns in a litre of Diet Coke. We all swerved around the map, arming ourselves wherever we could. Minutes after collecting a mediocre shotgun and a smoke bomb, I noticed that the squadmate who landed in the Tilted Towers died. Predictable. Undeterred, one squadmate and I continued on our way there, but from opposite directions. The third seemed to be doing their own thing around the Snobby Shores. Fine. I was nearing the Tilted Towers' perimeter when I realised that the squadmate who was meeting me there had died, too. Well, crap. I saw some stairs leading to high ground and followed them up a tall building. Surely, I'd peep a sniper rifle or something. My guy over in the Snobby Shores wasn't about to bail me out now. I had to fend for myself. It was oddly quiet. No footsteps, no gunshots. I entered the building's middle area and noticed a rare gun. I have hope, I thought. Nope. It was a trap. Footsteps. In two or three brief shots, an opponent nailed me with a pistol. My soul floated downwards into Tilted Towers' Tartarus. In Fortnite Battle Royale, four beheaded chickens do not intersect. Some die on their way to the processing plant. Others are made into nuggets. The takeaway here is that I need to get my friends into this. Ive started playing solo if my mates are not online, Ive found there is not much of a need to build stuff for me as Iand and lay low till the last minute and choose my shots. Solo is just too campy for my taste, 6 kills, good loot 3rd to last circle and then shotgunned by someone hiding in a bush. Its s safe and legitimate tactic, but far to slow for myself. Thats why you start in Tilted Towers and work from there. Honestly it's no much better in my experience, still being killed by people who will sit under a stairwell or behind a door etc. It's my own fault if I know they're in the building and am not cautious enough but there are times when you know they're just a scared little kitten who haven't moved since landing. Am realising Rando Squads is a waste of time the more I play, I'll maybe get lucky in 1 of every 10 matches and get a squad who want to work together, but even then they usually only jump into voice chat once we're on the 2nd to last circle. Otherwise it's insta lock Titled Towers, a 9yr old kids with no concept of volume control or someone who stick to you like a bad smell and gives away your position by picking a fight you clearly can't win. It's all in good fun though, I've started dropping with the insta lock Tilted, no point in dragging out a game longer than necessary. I love the various modes and how they create chaos. With that in mind, I wonder if a 33v33v33v1 mode would go... Or 1v99 with higher HP/armor and/or a headstart.. I don't think those ideas would work in PUBG, but Fortnite has the right cartoony attitude that might pull it off. Imagine being that one person and managing to win. 1 vs 99 would be a laugh. 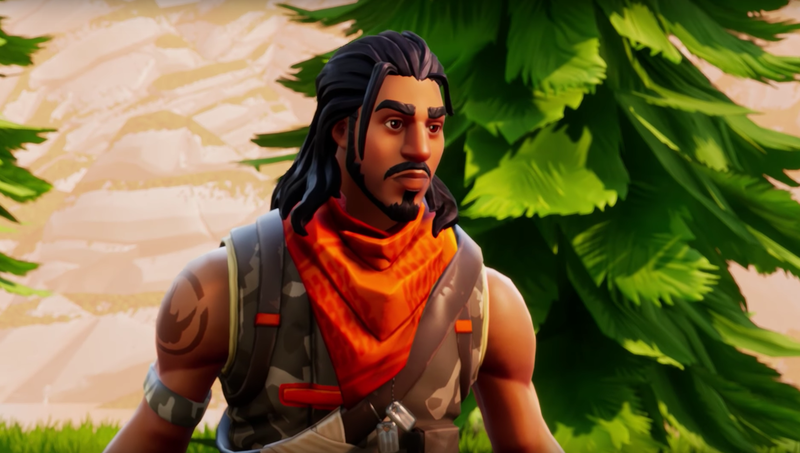 Give the guy unlimited resources and four legendary guns. Everyone else starts as per usaul. Would be interesting. Sometimes I'll try squad instead of solo when my friends aren't on and every time I'm grouped with morons who fly off on their own and die instantly. Never understood why some players queue for squad to just do their own thing without any communication.